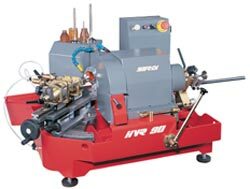 The SERDI HVR 90 has an horizontal valve rotation through fire face. Variable speed valve rotation. The SERDI HVR 90 has a high-accuracy for valve stems from 0.157" / 4mm to 0.551" / 14mm. Angle grinding range between 12 and 47 degrees.